Cath Kidston will have a 15% OFF PROMOTION valid on the 14th April only, on everything across their website excluding the Royal wedding merchandise and gift vouchers. The discount will run for the whole day ending at Midnight and you will need to enter the code CKPD at the checkout to receive your discount. The Cath Kidston fashion sale (25% Off) is included in this too so you could get up to 40% off women’s & kids fashion! 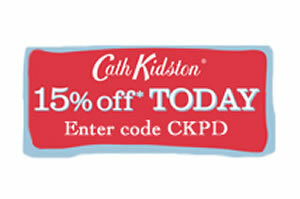 Hurry, this Cath Kidston promotion code is valid for 1 day only, click here to start shopping!! !